During this little lull and before the next round of activity I want to catch up on some blogging. 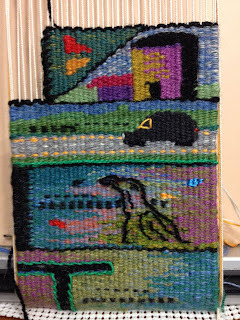 It has been a busy time with preparing the Tapestry handouts and preparing for the Fiber Christmas show but recently some of my projects are coming along. 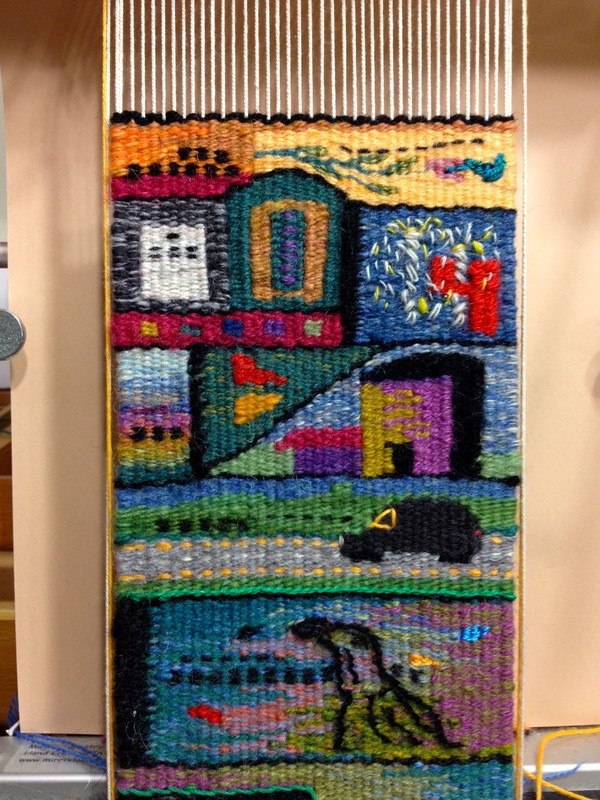 This morning I finished my Tapestry Diary for July, 2012 and took it off the loom! Actually it is June 26th through July 31. I snapped a picture right before the cutting off. 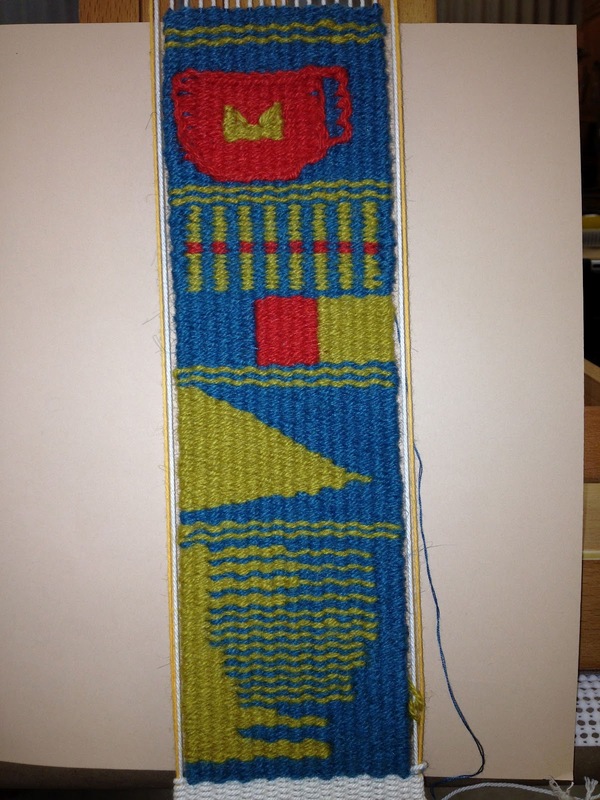 My warp length was so entirely used up that I had to resort to some needle weaving to complete the last bit. It was so much fun to do and very liberating in that the design just grew as the month progressed come what may. My plan is to warp today for August so that I can start the next one on time. For now I will probably have to do the months separately as I don't have a larger loom to use for the project but I am hoping to dedicate a larger one for the beginning of the year. 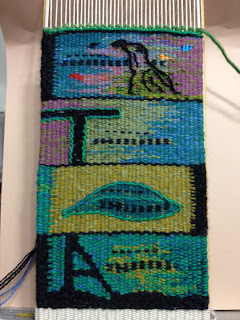 On the right is a picture of the finished July Diary right after I cut it from the loom. I will put up some more photos as the finishing takes place. Look what came in the mail yesterday! Yes, the new September/ October issue of Handwoven magazine. 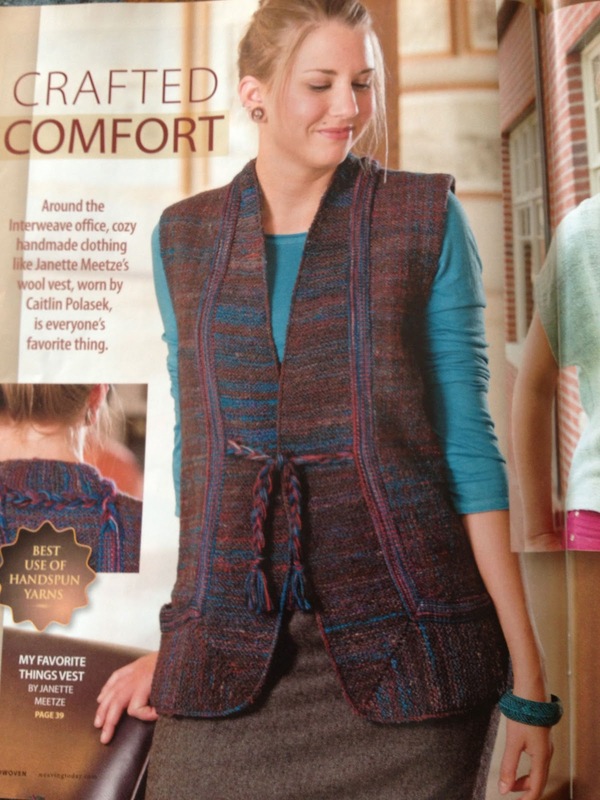 This is the issue dedicated to handwoven garments with the sleeveless garment contest winners and above is my vest. Thanks to the folks at Handwoven and my dear friend Lynn Tedder who prepared the article for printing I am looking pretty good. 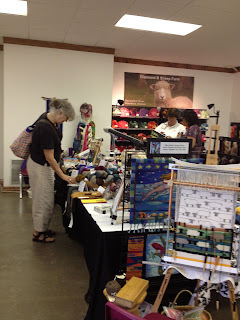 To conclude here are some pictures from the Fiber Christmas show this past weekend. We had a fabulous time. It is fun getting together with fiber pasionisstas and the energy and creativity litteraly sparkles in the air. 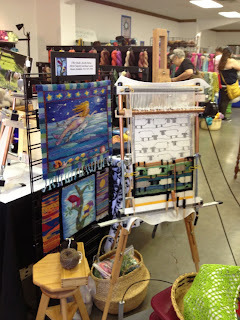 My good friend Donna Hilton allowed me to use part of her booth space for WIM at the show and here are some of the tapestries. I put the sheep breed tapestry sampler on an easel so that I could demonstrate the Mirrix treadle. Further down the table I had one loom with the tapestry diary in progress and two smaller looms with jewelry projects started. 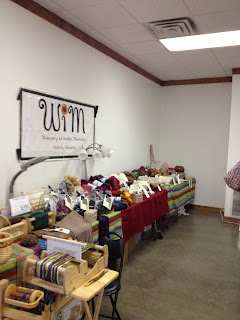 Here is a shot of WIM with all the lovely fibers, spinning and weaving equipment. 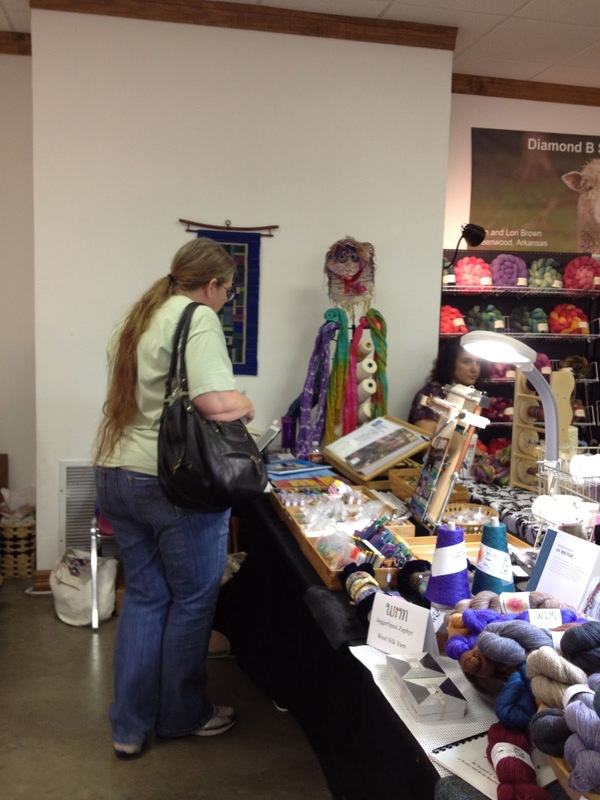 My friend Arlene checking out some of the finished bracelets I had on display. Some pre shopping going on before the show opens! 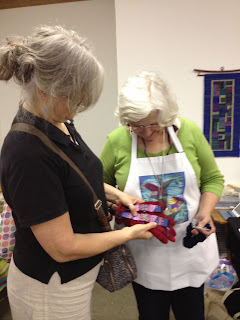 Arleen and Lynn are checking out each others work, Lynn's tapestry bead cuff weaving and Arleen's handspun, hand knitted gloves. Below is a close up. 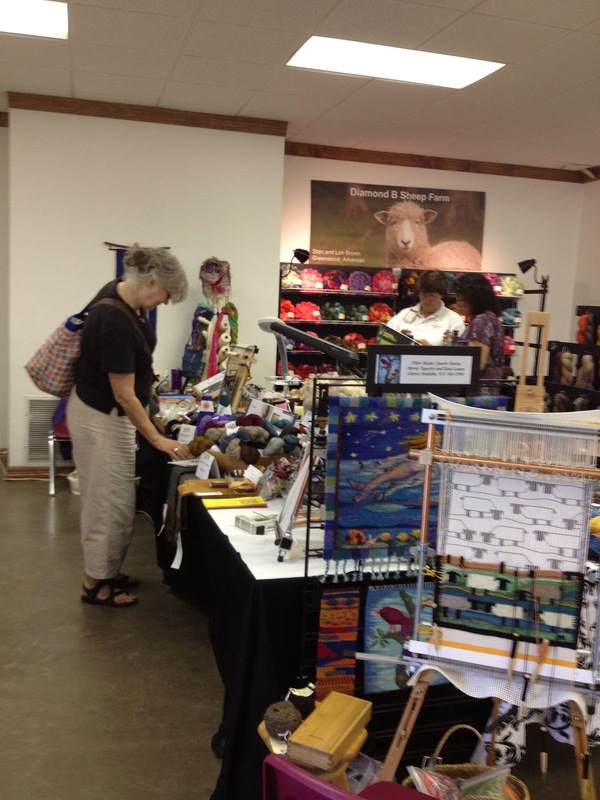 Soon I will be catching up with the Sheep Breeds tapestry sampler and Spinning Yarns for Tapestry part three using some of the wonderful fibers I found at the Fiber Christmas show. 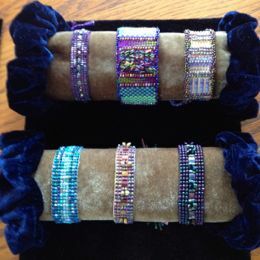 I also have new bracelet projects to share and the finishing of the July tapestry diary. As Calvin would have said to Hobbs "The Days Are Just Packed". 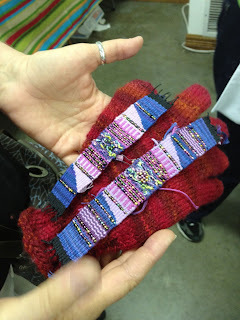 Life has been all tapestry and nothing but tapestry as I have been working on a set of handouts for several days now. I have finished almost two test samplers that I am photographing as the process unfolds. There has not been much blogging time as this project has taken over for the time being. Hopefully the reward will be a finished set of handouts for begining tapestry weaving! I thought I would share some of the progress on the Sheep Breed Sampler today. It is coming along nicely with three breeds represented now in two samples each. They are Cotswald, Navaho Churro and Romney. I am also keeping up with the Tapestry Diary and the part for July 8th celebrates a hummingbird sighting. July 7th shows my work on the handouts and July 6th was the day I made two copper frame looms. I have had to turn the tapestry again since this picture was taken. It looks like after the month of July I will need to plan a new warp for the diary project. 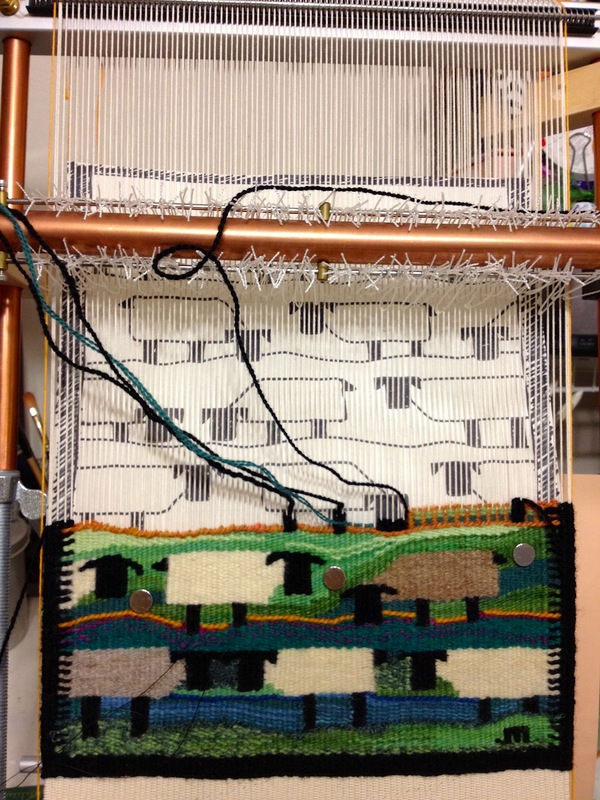 Here is a peek at the first test sampler that I have used for photographing tapestry techniques and the second one is half done at this point. It has been a busy summer! 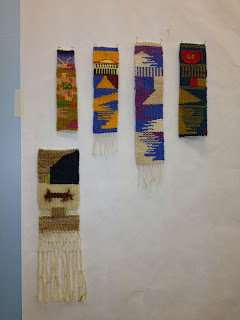 On the way home from arrowmont I made a stop at the Joe Evins Center for Applachian Craft. This was a tip given to me by a friend before I left town and what a good idea it was. The trip to the Center was one of the most scenic of the whole trip, wooded Tennessee hills, a glistening lake ,and well , the bridge that was shut down to one lane with a traffic light on each side was an adventure I hadn't t counted on but the surroundings were so lovely I just thought of the wait as an excuse to take it all in. The Center itself is on a beautiful piece of mountain property and the grounds alone with their walking trails would a reason in itself to visit. 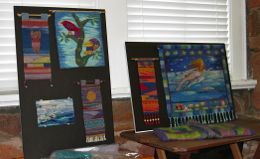 It is affiliated with Tennessee Community College and has several studios for classes and workshops. There were people working in the weaving studio so I didn't enter but my peek through the windows revealed a well equipped weaving studio, spacious, light, with many looms and supplies. Inside the galleries there were a couple of special exhibits and a gallery of craft which was spacious and varied with items of fiber, wood, ceramic and metal nicely displayed . I spent a happy hour or so browsing and speaking with the attendant. Some pictures I took on my little side trip follow. Well ,these pictures will make more sense if you look from bottom to top?. On the way back I was treated to some great views from an overlook area. I have been working on the tapestry diary and have actually kept up so I wove today, today! I can already see the value of this practice. Beside the obvious of having a wonderful and personal record of your days it is also a great discipline for improving your tapestry technique and a great way to try out new ideas, similar to a sketch everyday or writing every day. What you do everyday becomes perfected eventually, fluid and balanced. The first picture is the first few days from Arrowmont. 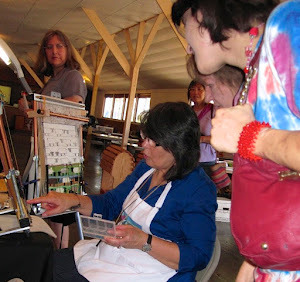 The first day on weaving my diary June 26th was the "A" for Arrowmont, a great place to get your art on or get on with your art. June 27th is a leaf surrounded in Green hemp soumac that I bought in the supply store, a symbol for new growth. The series of dots and dashes is my own system for the dates. 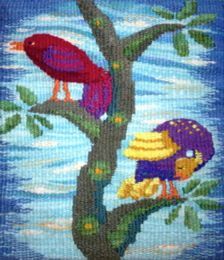 June 28th is a "T" for Tapestry, Thursday and Tennessee. Our last day of class June 29th I did a Soumac outline of a bird I had sketched earlier in the week. I think of our amazingly prepared and helpful instructor Tommye Scanlin as the bird. The small colorful shapes represent the rest of the class. On the first day we chose colored papers out of a bag and received a small sketchbook in the same color we chose so the tiny shapes indicate those colors for each person, red, blue, yellow orange and black. The dots and dashes are the date symbols. At that point I had to move the weaving forward so on to the next picture. June 30th I was driving home in my grey Subaru, on 7/1 I was able to walk through my front door, so I did a "7" that is the roof and side of the house and a "1" that is the front door. July 2nd was a quick weave with two very warm triangles to indicate not only the weather here in Oklahoma but the fact that I have lots of chores waiting for me after being gone a little over a week and weaving time is short today. July 3rd will likely be a rectangle shape. I am having fun with this. 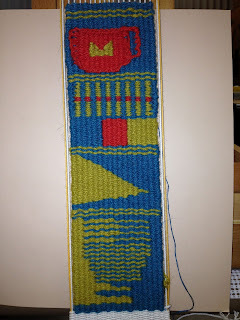 I am hoping to fit the rest of July and August on this sampler and then I will start a new one for Fall. Looking forward to the beginning of the year for a new start and the ideas that might evolve. I have the current diary on my twelve inch Mirrix but at the beginning of the year I will try to set aside a bigger loom for the project. Here is a picture of my finished technique sampler from Arowmont, finished with a red cup, my initials and some soumac outlining. I must admit to putting a rush on this so that I could spend more time on the diary. 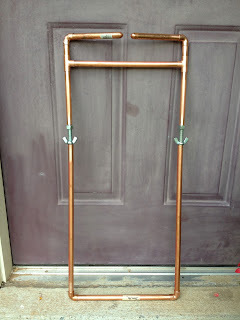 It was done on a copper pipe frame loom like the ones that we each made in class. Quite an adventure making a trip to the local Lowes and building our looms. 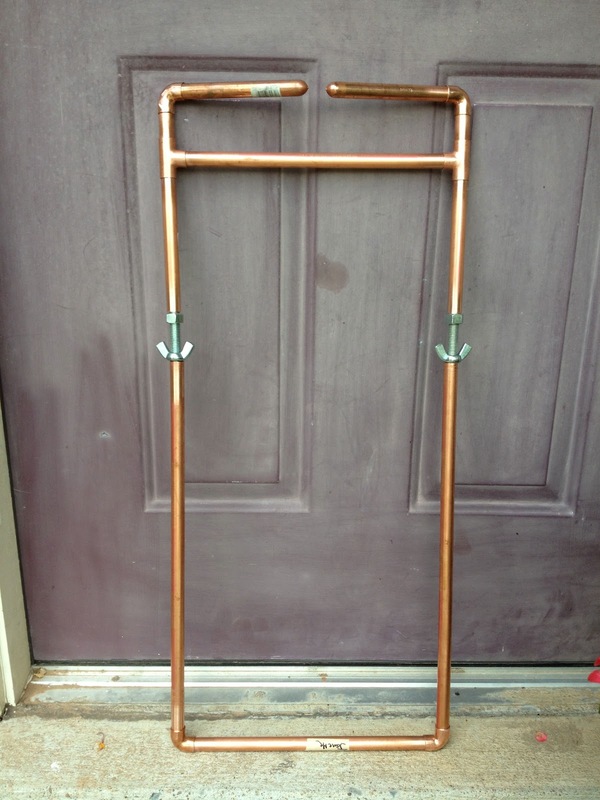 Archie Brennan style copper pipe fram loom with an attachment to accommodate Leashes. Look on his website for building information.